I never try apple with cheese together, have you? It actually tasted quite pleasant! Sweet apple slices with savoury salty cheese topping, something special compare to the usual traditional apple tart which tasted very sweet. As I do not want this rustic looking apple tart to taste too rich, I've chosen to make a pie crust which uses yogurt and olive oil, no butter needed at all! Though no butter is added into the crust, it is still very tasty and flaky after baking! Making of Yogurt Olive Oil Pie Dough.... I've added an egg yolk into the dough as I do not want the crust to look over dull and plain after baking. Place flour and salt in a mixing bowl. Whisk to mix. Add in egg yolk, yogurt and olive oil. Use a pastry scrapper to cut them into the flour. 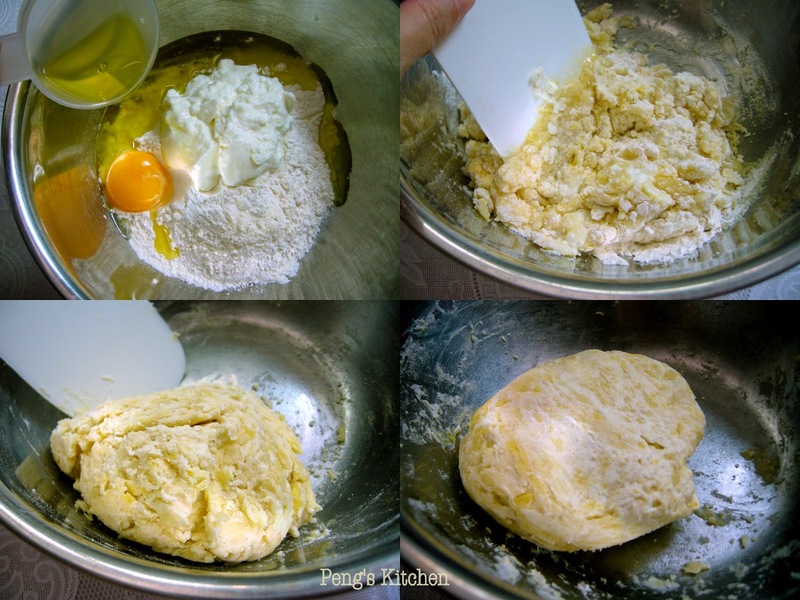 When the dough comes together, fold a few times to form a soft dough. Do not knead. Cling wrap and chill in fridge for at least 30mins before using. Fill a bowl of with water and add in lemon juice. Peel and core the apples and place into the water while slicing them. Cut the apple into half and slice each part into 4-5 slices thick. Drain away water. Sprinkle the honey and cinnamon over the apple slices and toss to coat evenly. Add in cornflour and zest and toss again. On a lightly floured surface, roll out the dough to about 12" wide. Gently move the rolled out pastry onto a lined baking sheet. 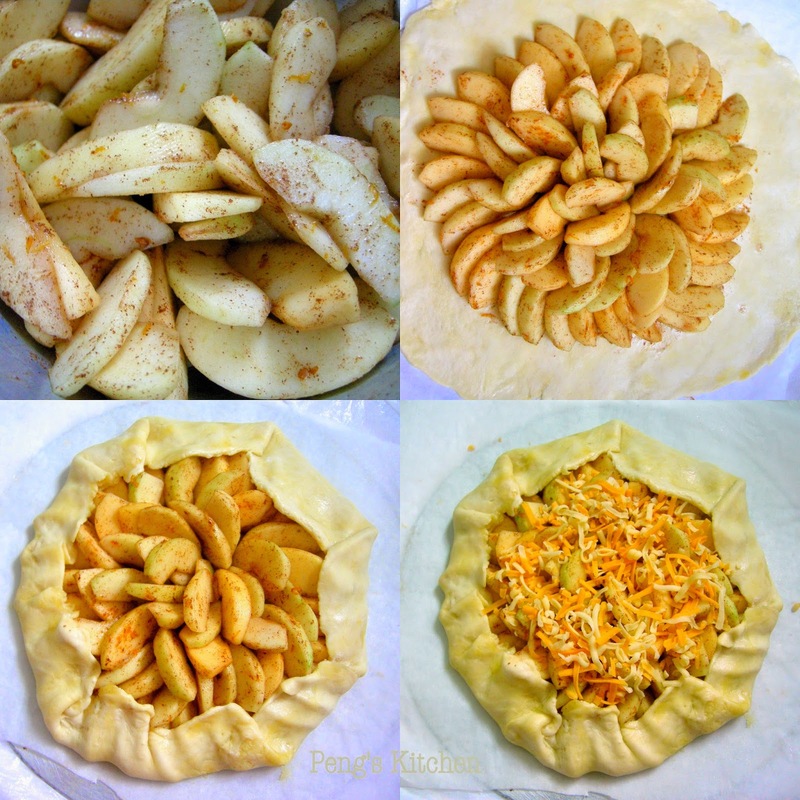 Starting from 2" from the perimeter of the pastry round, arrange the apple slices, side by side, in a circular pattern, filling the circle. Sprinkle the top of the apples with grated cheddar cheese. Fold the dough up over the apple slices, forming pleats with the dough. Bake in preheated oven at 200 deg for 15 mins. Lower temperature to 180 deg cel and bake for another 20-25 mins or until the crust is nicely browned and apples are cooked through. Cool down slightly before serving. This post is linked to the event, Little Thumbs up organised by Doreen from my little favourite DIY and me, Bake for Happy Kids, hosted by Kit from I-Lost in Austen at this post.